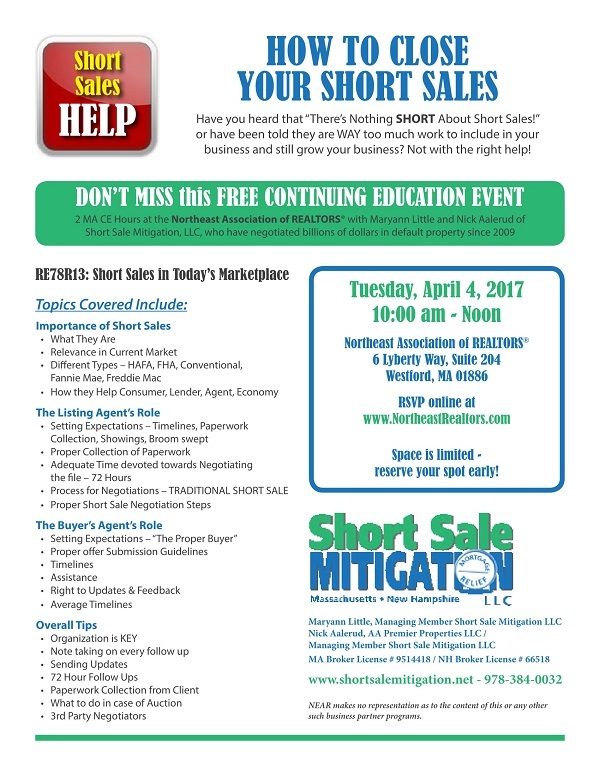 Maryann Little and Nick Aalerud of Short Sale Mitigation, LLC have been invited by the Northeast Association of Realtors to present on Short Sales in the 2017 year. This is a 2 MA CE class. This class will feature: What short sales are, What servicers vs. investors are, the listing agent and buyer’s agent’s role in the sale, and setting up your overall strategy for a successful short sale. Nick and Maryann, have been successfully negotiating short sales together since 2009, and formed Short Sale Mitigation, LLC in 2010 to meet market need. Short Sale Mitigation, LLC, has assisted hundreds of homeowners avoid foreclosure, and negotiated millions in default property. They are the most well known 3rd party negotiation firm in Massachusetts. To attend the class, RVSP online at www.northeastrealtors.com, 6 Lyberty Way, Westford, MA and for more information on short sale negotiation services call Maryann Little, from Short Sale Mitigation at 978-384-0032, or log onto wwww.shortsalemitigation.net or www.massachusettslossmitigation.com.